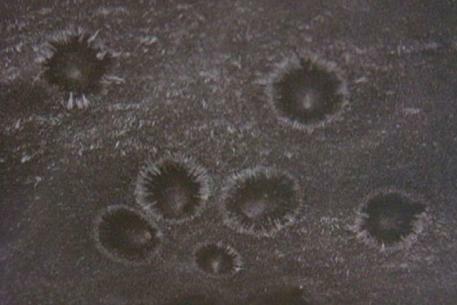 Electrostatic Discharge patterns in a thin layer of dust on a CRT are similar in many ways to some enigmatic features seen on certain moons and planets. 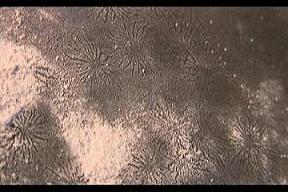 This simple experiment may help explain those planetary surface features. Without a testable explanation, our understanding of solar system history is questionable. Spidery markings, seen for example on Mercury and the Moon, are among the most puzzling of planetary features. 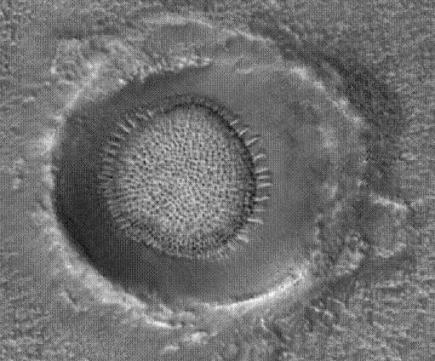 These spidery channels are rounded depressions radiating from a central depression or crater. However, a closer look reveals a resemblance to laboratory electric discharge patterns. 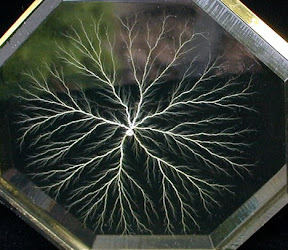 Electrical discharge patterns take many forms, which have been shown to be scalable from the laboratory to the cosmic scale. 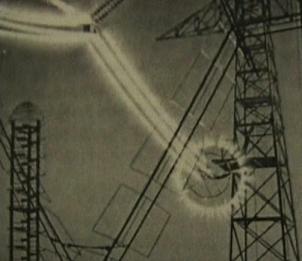 The radials have been seen in experiments to be the result of surficial leader-strokes of an electric discharge, which may with higher currents form other features such as crater chains. We propose that there is an electrical cause for many surface features seen throughout the solar system. The approach taken here is an empirical investigation of plasma discharge effects on various surfaces that provide a parallel to planetary surfaces . Experiments with electrostatic discharge to a dust covered CRT produced the following features which match similar planetary markings in great detail. An investigation of plasma discharge effects upon mock planetary surface materials may provide new insights into the history of the solar system and the importance of plasma discharge phenomena in astrophysics and planetary science. Now for some of the great news, resulting from Au_Daves info on recovering old threads. Here are the pages from the former thread which have been recovered, if you find more please send me the link so i can save it. we have pages: 1,2,3,4, Missing ,10,11,12,13,14. I'll provide links to all these as requested and will have a page made soon which will be linked to from here. dahlenaz wrote: Now for some of the great news, resulting from Au_Daves info on recovering old threads. I've saved to disk hard copies of all up through 14. I've found that in trying to track down individual pages, entering a couple keywords from the title does not always work. However, if you can get it to regularly return the first couple records matching the right thread, it's easy to also get specific pages to come up. came up with that specific page out of the thread. IE, it searched for the exact term "crt discharge patterns" (which was fairly unique) and ALSO "page 5," thus page 5 of that thread was just about the only result it showed. The offer to attend ICOPS 2008 conference in Germany is still open. My plan is to pay the student registration so that a verifiable student can attend. If someone else who is not a student wishes to attend, part of the registration will be covered. The person who attends will be named as a co-author and is expected to place the poster presentation on the prescribed day and location in exchange for the registration fee being paid. To me this sounds like a good deal. Last year i attended ICOPS 07 and it was worth the effort and i only made two days of the conference of material, almost everthing, beyond my comprehension. There were many opportunities to introduce people to the electric universe and interact with them. Most people were very open to the electric universe perspective. 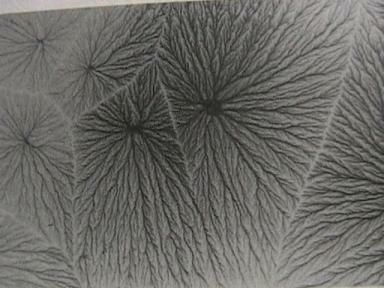 This image of a million volt test of power transmission lines highlights the focus needed on coronal characteristics of a discharge and their features which share similarities to electrostatic discharge patterns in surface dust. 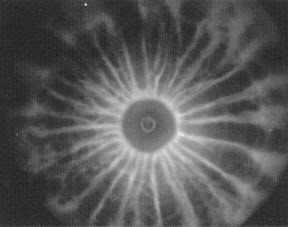 This image from A.D. Moorse's book 'Electrostatics' reveals a radial symmetry that is also noted in high energy plasma lab experiments, petroglyphs and other ancient representations associated with celestial event in a distant time (yet to be realized in full). A relationship between coronal discharges and planetary features may not involve any of these observations with the exceptionof high energy lab experiments which produce the visible characteristics which would not be seen at the low energy level of electrostatic discharges which formed the CRT spider features. Two images of particular interest are the end-on recording of a plasma gun penumbra(fig.4.21), similar in many ways to the corona image above. The other image to be added here is also from A. L. Peratt's book 'Physics of the Plasma Universe' figure 4.19 <br>An image of Lichtenstein figures recorded of an acrylic insulator used in a terawatt pulsed-power generator. <br> In the paragraph 4.6.1 explaining the feature he goes into details that may apply here in reference to Mercury and other features. In reference to the image he explains that "Surface discharges are produced by large electric fields that develop between the surface and subsurface layers in a dielectric material as a consequence of energetic charged-particle deposition." I'll add more of his explanation on the poster08 webpage. dahlenaz wrote: Two images of particular interest are the end-on recording of a plasma gun penumbra(fig.4.21), similar in many ways to the corona image above. The other image to be added here is also from A. L. Peratt's book 'Physics of the Plasma Universe' figure 4.19 <br>An image of Lichtenstein figures recorded of an acrylic insulator used in a terawatt pulsed-power generator. Ohh, I see. Looking for those very specific images... Afraid I don't have access to that book, methinks? Or do I...? Hmm, will have to check. This is part of the image which really speaks volumes and captures the dynamics of surface discharges. Here is the explanation from Tony Peratt's book. 'Physics of the Plasma Universe'. "Surface discharges are produced by large electric fields that develop between the surface and subsurface layers in a dielectric materials as a consequence of energetic charged-particle deposition. For example, when space craft dielectrics are exposed to bursts of kiloelectronvolt particles during magnetic substorms, the particles penetrate a few micrometers to a few millimeters, building up field strengths which may be of the order of hundreds of kilovolts per centimeter. A schematic representation of this is shown in figure 4.18. If the material is a conductor or a semiconductor, a conduction current will flow in response to the charge deposition and will effectively neutralize the field. If the material is an insulator, the space charge will build up at a rater faster than the local relaxation time, and the associated electric field will increase. When the field reaches a critical value that depends on the material, surface smoothness, and porosity, a surface discharge will occur. This is a problem that often occurs in laboratory pulsed-power and, in fact, is a limitting constraint on how much power can flow in laboratory transmission lines. Figure 4.19 illustrates the "lichtenstein figures" recorded just below the surface of an acrylic transmission line spacer. Voltage breakdown at dielectric interfaces nearly always results in the formation of these dendritic-type streamers. 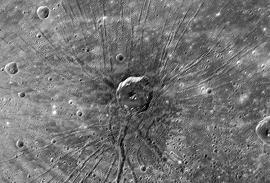 Surface discharges will also occur on natural dielectrics in the solar system when these surfaces are exposed to large fluxes of energetic particles. This condition can be found, for example, where magnetospheric currents interact with the surfaces of the giant planets and their satellites." I think a question to raise is: what is the frequency of these discharges? Can they be predicted by some saturation calculation? and, Does the discharge 'need' to involve another body? Can it be from one region to another of the same body. I suspect these are old questions, but for the sake of my education, please bring me up to speed on this. The experiment which formed the CRT features involved two monitors passed in close proximity. The corresponding features on the other monitor are circular with inward extending finger from the rim. This material was deposited, transfered, to this surface. dahlenaz wrote: The experiment which formed the CRT features involved two monitors passed in close proximity. The corresponding features on the other monitor are circular with inward extending finger from the rim. This material was deposited, transfered, to this surface. Save for the central region these remind me of low energy corona discharge in a circular conductor as seen in the second image at this site. I'm just guessing that was a typo in Peratt's book (as I see in the caption and the prior paragraph[s]). Granted, Lichtenberg and Lichtenstein are both cities... So, I can see where the confusion might have come from. But the figures are named after the man, rather than the city. Would you be refering to the material that has accumulated or the areas absent of material? Comparing the feature with the corona itself seems like it may need some further discussion on exactly what happens during the discharge. I'd like to point attention back to this image introduced by Stefan.